strawberryluna TODAY Show 2015 Toyota Summer Concert Series Posters! Around these parts? Sometimes we have big announcements, and sometimes we have BIG ANNOUNCEMENTS. This news counts as the latter. We have been hard at work for 4 months (and counting) on a dream project that’s really hard for us to believe even now is a reality. 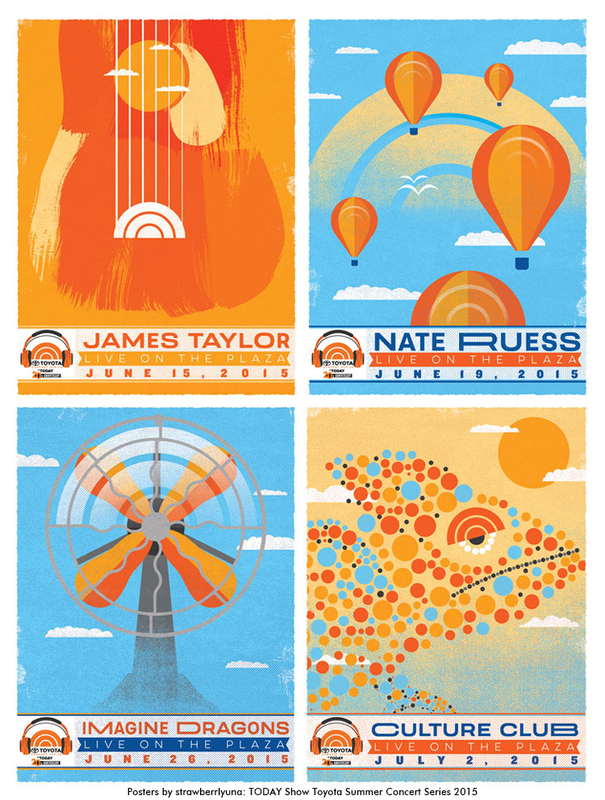 We are beyond honored, excited, thrilled and delighted to finally be able to share that we have been working with the iconic TODAY Show this year to create posters and identities for each and every one of the TODAY Show Toyota Summer Concert Series performances, broadcast live from Rockefeller Plaza all throughout the entire summer. This year marks the 20th Anniversary of the TODAY Show Summer Concert Series as well. And both of us being lifelong fans and viewers of The TODAY Show, it’s an amazing honor to be an official part of the show’s history. 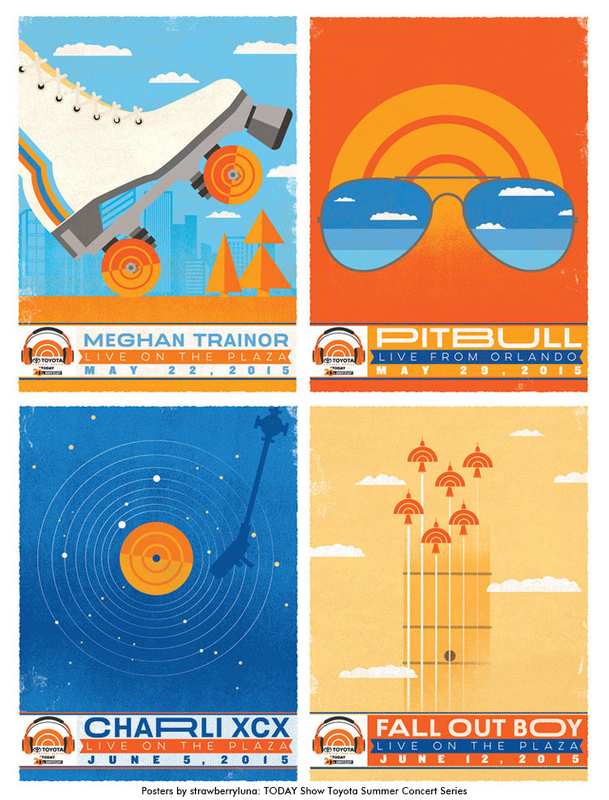 Below are our posters for the first 8 of more than 20 musical artists who will play on The Plaza this year, with the designs that we created for The TODAY Show being given away to fans as posters, used as VIP pass art and t-shirts for VIPs on Rockefeller Plaza during the TODAY Show Toyota Summer Concert Series shows. We will be sharing each of the posters and designs that we created for each musical artist appearing in the Summer Concert Series throughout the rest of the summer both here an on our own Facebook Page, Twitter and Instagram accounts so you can follow us there, ask questions and learn more about this super fun project. And you can follow along with The TODAY Show’s Facebook, Twitter and Instagram accounts too for behind the scenes photos and videos as well. To see the original TODAY Show Toyota Summer Concert Series video and full lineup thus far click here. Meghan Trainor, Pitbull (in Orlando), Charli XCX, and Fall Out Boy. Click the artists names links to see their live performances. James Taylor, Nate Ruess, Imagine Dragons and Culture Club. Click the artists names links to see their live performances. We will be sharing more work for the TODAY Summer Concert Series, so stay tuned!